Really curious to see what Fiesta Texas is getting. hmm. . whatever it is, I'm ready. I honestly have no idea what the ride will be. But with tallest, it sounds like a tower ride. 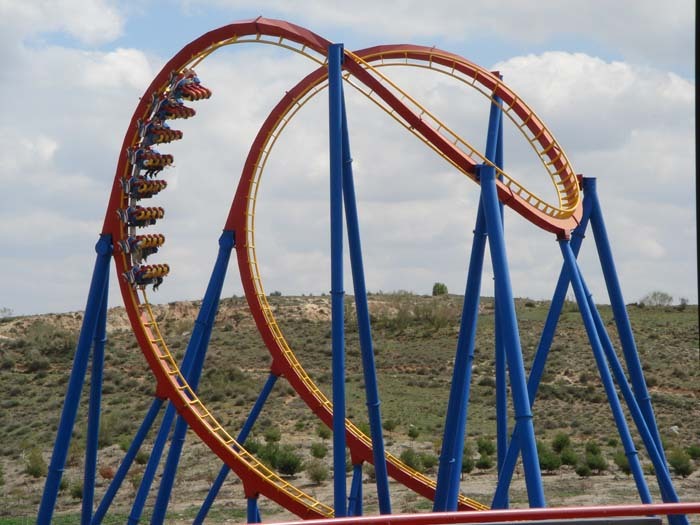 Maybe something like Falcon Fury to be different from Scream. Mrlittle wrote: I honestly have no idea what the ride will be. But with tallest, it sounds like a tower ride. Maybe something like Falcon Fury to be different from Scream. maybe they're moving in a Mr Freeze? (it *would* fit.. being right there by Batman, and could be raised so the pathway goes under it). The fastest ride in park history would be the old wooden Rattler at 73mph. The tallest is a tie between Scream (S&S Tower) and Skyscreamer (Funtime Starflyer) both 200ft. Sportsdude360 wrote: The fastest ride in park history would be the old wooden Rattler at 73mph. The tallest is a tie between Scream (S&S Tower) and Skyscreamer (Funtime Starflyer) both 200ft. I just realized both the tower rides are themed to "screaming"
The Joker Wild Card, one of the world’s tallest pendulum rides, to debut in early summer 2019 at Six Flags Fiesta Texas! Standing at a record-breaking 17-stories in the air, this impressive giant disk will reach speeds up to 75 miles per hour, as it whips back and forth — higher and higher to give riders a staggering view of the world below them. Last edited by robbalvey on Thu Aug 30, 2018 5:09 am. That's going to be awesome swinging above Superman. Man! I really love this park! I need to get back so badly! Similar to their announcement about SFOT's Larson Looper, I am wondering if this is tying the "World's Largest" record that Wonder Woman is setting over at SFGAdv, or coming up just shy of that ride's swing height? YES! I love these things and am really excited to be getting one. I wonder if it's a different model than a Giant Discovery since Jeffrey said it wouldn't be a Giant Discovery? Or was he just trolling?